Starting with a little bit of humor the illustration on the left gives an impression of how the voltage of the battery is trying to force amps across the motor. The faster a motor turns the more voltage it needs; in part because it acts as both a motor and generator. 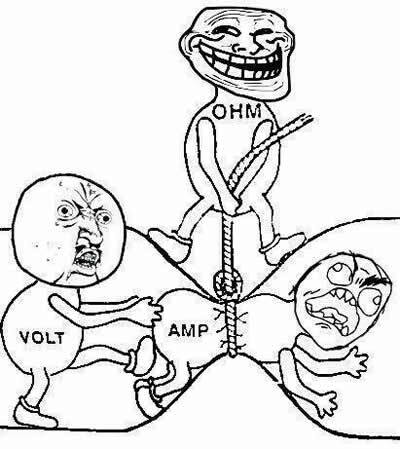 To put simply the faster it turns the higher the voltage has to be to overcome the voltage its ready to produce. You can run a motor rated at 48 volts on 24 volts; it will have just as much power until it reaches 1/2 the speed it would on 48 volts. Likewise you could run a motor rated at 24 volts at 48 volts. Not only would it turn at twice the speed, it would overheat twice as fast, and at that point it will fry the coils. 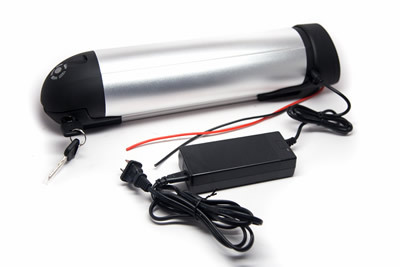 Always select a battery voltage the motor and controller is rated to handle. Current as measured in Amperes or Amps is what gives the grunt. The more current that flows, the more force the motor delivers. When you multiply the speed (volts) times torque (amps) you get work (watts). Amp-Hours is how many Amps the battery will supply in an hour. You could compare that with how many gallons the gas tank will hold. So lets say you have a 48V 10AH battery; you could also say that battery has an energy capacity of 48V * 10AH = 480 Watt-Hours. Batteries are usually the most expensive single component of an E-Assist system so sizing the battery beyond your needs adds cost and weight. Here is a handy chart to baseline how much power you'll consume on a ride. The 3 different motors will generally consume at different rates due to the respective efficiencies. Treat them as generalizations because even for the same person these numbers will vary from one ride to the next. Lets say you want to power a Direct Drive(DD) Hubmotor over an extended ride. Recall from the DD Hubmotor page you don't want to run out of power else you become a generator. So if you have a 48V battery, (500 WH/48V) = 10.4 AH. You could probably get away with a 10AH battery just fine. Keep in mind the numbers we're using are on the conservative side and even better most 48V batteries are actually a few volts higher. OK so you've selected a 48V 10AH battery. Next is knowing the maximum amperage the motor/controller can draw. Lets say the controller maximum specification is 30 Amps. "C" rating of the battery will determine the maximum discharge rate. If the battery is rated at "3C" that means a 10 Amp-Hour battery can discharge at 30 Amps. But there is more to it than that. Lithium batteries need a Battery Management System (BMS) to balance the cells during charge and discharge. So even though the batteries may be able to handle a 30 Amp discharge if the BMS is only rated to 25 Amps its going to blow at 30 Amps. Worse is many battery pack builders seem to neglect mentioning the BMS rating. Okay so now you have a good way to approximate the capacity of the battery you'll need. But what about the chemistry? You've got them in your car. Most airplanes use SLA to start with. They're the least expensive and heaviest and really aren't ideal for electric assist. 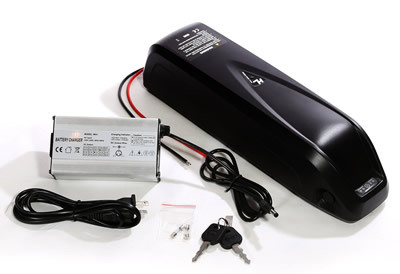 For a 48V 10AH SLA battery pack cost will be about $160 with a weight of 40 lbs. You'll pitch them after about 200 charge cycles. We've all heard stories about Lithium battery fires from hoverboards to e-cigs to airplane electrical storage units. While each of the battery chemistries are discussed below you can read more detail in a White Paper from Underwriters Laboratories in Safety Issues for Lithium Ion Batteries. These are more like dual purpose batteries. One in a hundred make a dandy blasting cap at some point within 100 charge cycles. You've heard about hoverboard and e-cig fires; Li-Poly batteries. They're plenty cheap and pack the most power to weight, but as Nancy Reagan once said: "Just say no". Enough said. This is what you'll find in cell phones, PC's and Tesla cars. They've come a long way with some variations in chemistry. They are the most popular for Electric Assist as well. Both Panasonic and Samsung have locked horns coming up with a better battery and either manufacturer builds a great product. The trouble is many China manufacturers also make counterfeits of these batteries and sell them packaged as E-Bike battery Packs on Alibaba, E-Bay and other internet stores. So unless you know who you're buying from its caveat emptor. That said a decent 48V 10AH battery pack in a rack mount aluminum case or bottle type mounts will weigh in about 8-9 lbs and cost in the range of $400-$500. Maybe half a pound less for the fabric triangle bags which are OK if you don't mind the potential of impact damage or the bag tearing. Most of them seem to tear in less than a year. There is a standard size of Li-Ion battery the 18650 which basically means its 18mm diameter and 65mm long. they have a cell voltage of 3.7V and anywhere from 2.2 AH to 3.7AH. A 48V 10AH battery pack will have 14S which means 14 in series (14*3.7 volts = 51.8 volts) and 3P or 4P, which means 3 or 4 in parallel. That said a 14S 4P battery pack will have (14 * 4) = 56 of the 18650 cells all wired together with a BMS tucked inside the package. Remember that "C" rating? In order to increase the discharge rate the anode inside the battery needs to be larger which reduces the potential Amp-Hour value. Nothing is free. One more thing; typically if you stay within 80% discharge rates, expect about 800 discharge cycles before the battery looses appreciable capacity. Generally after 800 cycles that 10 AH battery degenerates into an 8 AH battery. It will still work, but drops away quickly after that. The bad news with Lithium Iron batteries is a 48V 10AH battery in a rack will weigh in about 13 lbs, 4-5 more than the Li-Ion. Now the good news. These batteries are as safe as they get with rechargables. They typically have great discharge rates, often twice that of Li-Ion. While they have a cell voltage of 3.3 V, they don't have the voltage sag that Li-Ion tends to have. And best yet is they are the longest life, generally over 2000 charge cycles before the 10AH capacity drops to 8AH, and it will take another 2000 charges to become a 6AH battery pack. Cost is generally about the same as Li-Ion. Lithium battery packs have to balance the charge for all cells individually which requires a charger with very clean power. The internal BMS will measure cell voltages individually through cycles of charging and once a certain level of charge is reached will begin a series of "micro charge" bursts which accurately measure voltage and currents into each cell. Its that micro charging managed by the BMS that helps extend the life cycle and safety level of the battery. 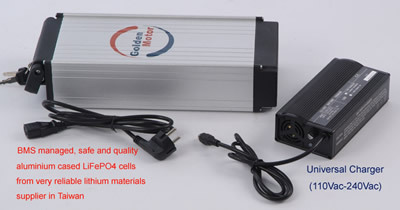 Often the internals of a battery charger are designed to work with different supply voltages and equipped with different plugs depending on the country they are shipped to. If the charger bears the label of UL Certified its going to be good. UL registered is also good but that doesn't mean its been tested by UL, rather it was tested elsewhere with test reports submitted to UL. Other certifications such as CSA are OK but UL is best for the USA market. No agency certifications would be best to avoid. Lithium batteries are considered a potential hazard by shipping companies which means they charge a premium price to ship. Some domestic battery pack builders try to risk shipping them without declaring the content and eventually get caught. You may not want to buy from someone who cheats the shipper; imagine how they treat customers. The list below are examples of current battery offerings to and show the better packaging options for mounting on a trike. You may want to check with the vendors on their offerings at the voltage levels and configurations as well as any special offer they may have at the time. While there are many other suppliers who deliver value these are the only ones we have enough knowledge of to recommend. 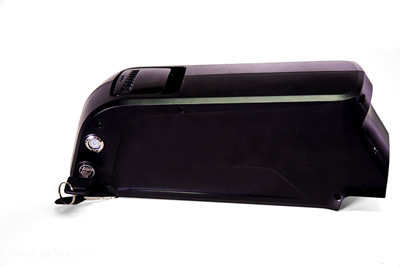 Golden Motor rack mount battery slides onto a steel shoe plate and locks with a key. Good quality. Luna Cycle bottle battery slides onto base and locks with a key. Luna Cycle is in the LA area.